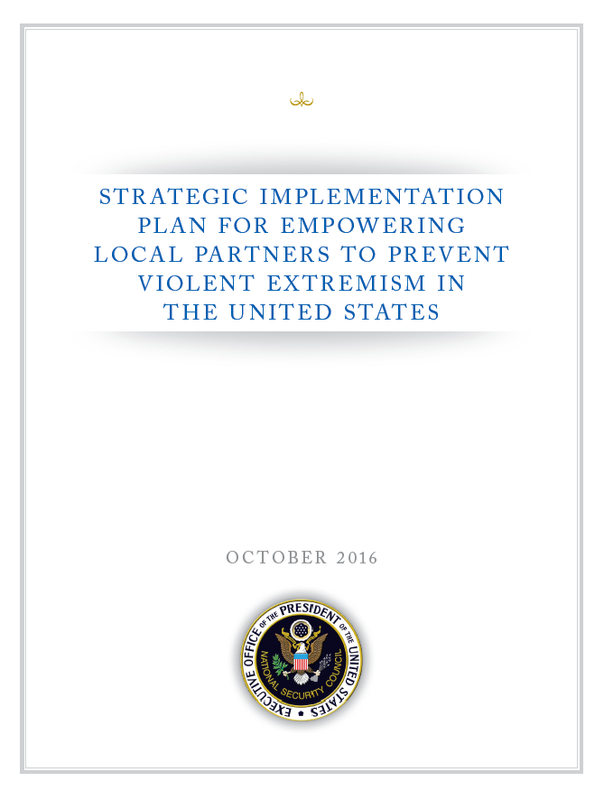 In 2011, the United States adopted the Strategy for Empowering Local Partners to Prevent Violent Extremism in the United States (Strategy) and a corresponding Strategic Implementation Plan. Since publication, the mission to prevent violent extremism has progressed, and violent extremist threats have continued to evolve. The overall goal of the Strategy and United States Government efforts to implement it remains unchanged: to prevent violent extremists and their supporters from inspiring, radicalizing, financing, or recruiting individuals or groups in the United States to commit acts of violence. This updated Strategic Implementation Plan responds to the current dynamics of violent extremism and reflects experiences and knowledge acquired over the last five years. It replaces the 2011 Strategic Implementation Plan for Empowering Local Partners to Prevent Violent Extremism in the United States. Violent extremism is a persistent and dangerous problem in the United States, and single instances can have far-reaching consequences. Violent extremists have many motivations and are not limited to any single population, region, or ideology. Over time, different forms of violent extremism have come to the fore, and new forms will likely emerge in the future. In many ways, the threat of violent extremism today is more challenging than ever before. Violent extremists have demonstrated an ability to entice people to travel great distances, to direct attacks, and to inspire others to act from afar. They have utilized the Internet and other technologies, specifically social media platforms, as a means to reach a greater number of people in more places, tailor messages to appeal to different audiences, and reach out to potential recruits individually. There is no single cause of or pathway to violent extremism. This requires a comprehensive response that empowers stakeholders at the local level. Local stakeholders are most likely to be able to address the drivers of violent extremism or interact with someone who needs support to avoid becoming radicalized to violence. This Plan aims to ensure that all stakeholders have the knowledge and tools they need to prevent individuals from supporting or committing an act of violence. As the Strategy states and this Plan reaffirms, strong and resilient local communities are the most effective means of safeguarding individuals in the United States against violent extremist recruitment and radicalization. Resilient communities are those where violent extremists routinely meet disinterest and opposition and where recruitment attempts regularly fail. Such communities know what tools and support are available to assist individuals that may be on a path towards violence. At the outset, it is important to clarify the scope of this effort. The term “countering violent extremism,” or CVE, refers to proactive actions to counter efforts by extremists to recruit, radicalize, and mobilize followers to violence. Fundamentally, CVE actions intend to address the conditions and reduce the factors that most likely contribute to recruitment and radicalization by violent extremists. Where possible, CVE should be incorporated into existing programs related to public safety, resilience, inclusion, and violence prevention. This Plan addresses all forms of violent extremism and will be carried out in partnership with non-government stakeholders. CVE efforts do not include gathering intelligence or performing investigations for the purpose of criminal prosecution. In 2015, the United States Government performed a review to ensure that it is optimally organized to carry out the CVE mission. Representatives from ten departments and agencies identified four necessary components: infrastructure to coordinate and prioritize CVE activities across the Federal Government and with stakeholders; clear responsibility, accountability, and communication internally and with the public; broad participation of departments and agencies outside national security lanes; and a process to assess, prioritize, and allocate resources to maximize impact. In response, the interagency CVE Task Force was established to: (1) synchronize and integrate whole-of-government CVE programs and activities; (2) conduct ongoing strategic planning; and (3) assess and evaluate CVE efforts. The CVE Task Force brings together experts from DHS, DOJ, FBI, NCTC, and a variety of other Federal departments and agencies. Its work is organized into four lines of effort: Research and Analysis; Engagement and Technical Assistance; Interventions; and Communications and Digital Strategy. The lines of effort align with the Strategy’s three priority action areas: (1) enhancing engagement with and support to local communities; (2) building government and law enforcement expertise for preventing violent extremism; and (3) countering violent extremist propaganda while promoting our ideals. (See Table 1.) These tenets guide the work of departments, agencies, and the CVE Task Force in carrying out this Plan. Implementation will begin under current funding levels, though future dedicated funding will be required to fully realize the goals of the Strategy.